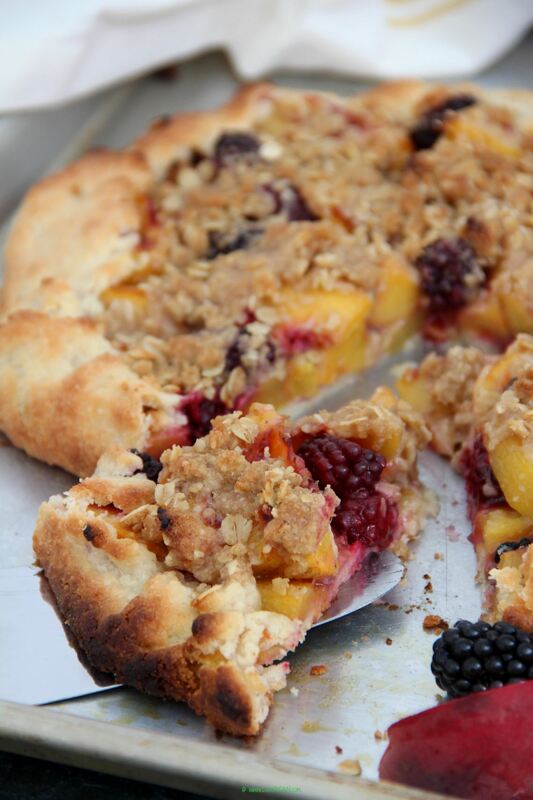 A crostata is a rustic free-form version of an open fruit tart. 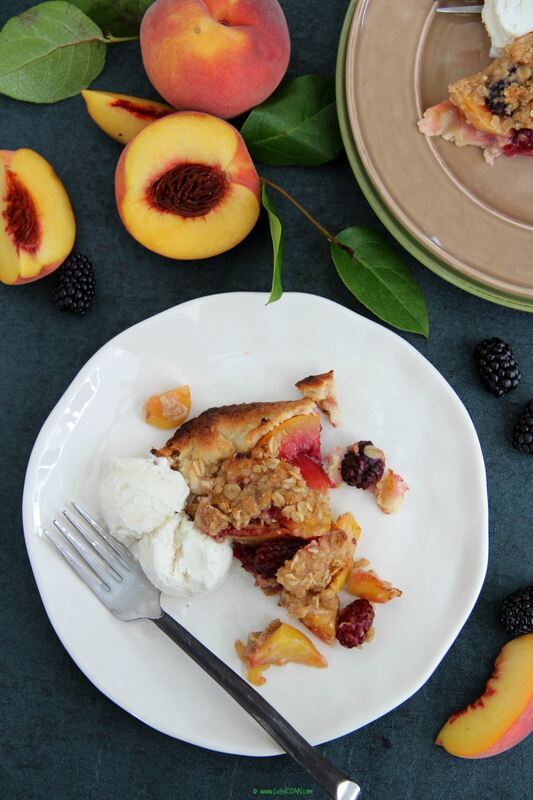 You can make a crostata with pretty much any kind of fruit that you like…apples, pears, apricots, plums, berries…but this time of the year I love to use peaches. They are ripe, juicy and sweet. The blackberries add a slight tartness that help balance out the flavors, along with the beautiful wine color it adds to the crostata. The dough is quick to put together, buttery, crisp and flaky. The dough can be make ahead of time and refrigerated for a couple of days. This dough also freezes very well. The crumble topping adds a crunch and the cinnamon and all-spice add an earthy warmth to the crostata. 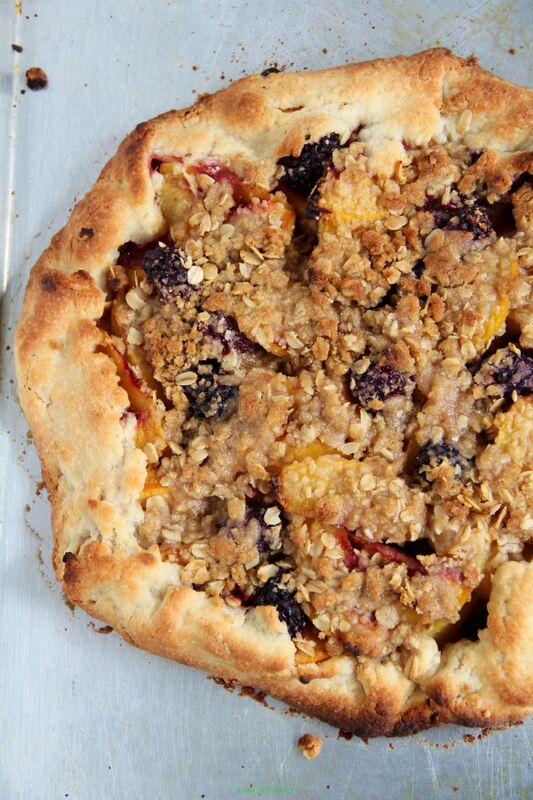 I have adapted this recipe from Ina Garten’s summer fruit crostata. Another reason I love this crostata is because the dough, fruit filling and crumble topping can be made the previous night and refrigerated separately. Just put it together the next day and bake. It is great served warm with a scoop of vanilla ice cream…Yummmmm!!! Add butter and pulse a few times until the butter is the size of peas. With the mixer on add the water through the feeding tube and pulse a few more times until the dough just comes together. Turn the dough onto a well-floured surface. Using your hands bring the dough together and roll it into a ball. Flatten the ball to form a disc. Wrap the disk in plastic wrap and refrigerate for at least an hour or until you are ready to use it. Place the sliced peaches and blackberries in a bowl. Toss them with flour, sugar, orange zest, orange juice and all spice. Line a baking sheet with parchment paper or spray with non-stick baking spray. Roll the cold pastry into an 11-inch circle on a lightly floured surface. Transfer it to the baking sheet. Place the fruit filling in the center of the dough circle leaving a 1½ – inch border. Gently fold the border of the pastry over the fruit, pleating it to make an edge. Bake the crostata for 20-25 minutes, until the edges are golden and the fruit is tender. Allow it to cool for 10 minutes before serving.